I found this candleholder at the thrift shop a few months ago, and just knew it had potential. I finally got around to doing something with it. Of course, I forgot to take a 'before' pic so you could see the ugly, 'brownish-don't know what color that is' color that it was. I spray painted it Ivory, and then added chandelier crystals and beads. Filled it with soft pink votive candles....and I love it. Hope you're having a sweet weekend. I was given this sweet award several days ago, and I'm just now getting around to posting it. 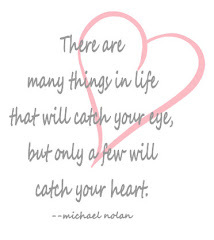 I am so thankful for the wonderful blog friends I've made, and for the sweet new people I'm meeting all the time. I appreciate everyone who visits my blog and for all the sweet comments.....they really make my day! 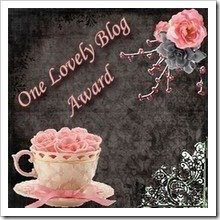 Thank you for the pretty blog award, Lisa. I appreciate you. Have you tried a new recipe recently? Have you learned a new technique? Did you find a new product you can't stop using? Are you experimenting with a new form of art? What are you playing with lately? We certainly like to know about it! So, I'm joining the party to tell you about my newest obsession....ribbonwork. I saw this book on another blog several weeks ago, and bought it, right then. I bought my copy at Amazon.com. And I'm hooked! The book is filled with beautiful pictures and easy to follow instructions. I've been making flowers and leaves ever since. In fact, now I'm just making and collecting them. When I want a flower for a project, I can just grab an already handmade one, or make a new one. It's been so fun! Here are a few things I've made using my flowers. I did this little paper mache box for a swap. And I made two more for gifts too. I used some on a crown. And I've used one on a page of a fabric journal I'm creating. And a couple of days ago, I started thinking....if ribbon works, why couldn't I use fabric. I made this rose from a couple of pretty, old blouses I found at the thrift shop. I'm definitely hooked! Here are a few more pics from the book. One day, I'm going to make this hat. It's gorgeous! If you want to see more of what people are creating....follow the link above. Andrea at Vintage Bella Studio is celebrating her 100th post, and she is having one of the prettiest giveaways I've ever seen! This is a very small peek at what she is giving the lucky winner. She has such a beautiful blog, filled with yummy eye candy. Follow the link to visit her blog and sign up to win! I received this sweet gift today from Katie at Rose Breeze Boutique. It's the bride from her Wedding Par Tea line of pretty tea bags. Look at her pretty pink rose, which is actually attached to a tea bag, hidden under her dress. And her veil....*squeal*....is soooo pretty with a little paper rose attached! Katie also sent me these cute little cards. They are printed from vintage images, and some of Katie's own paintings. Thank you Katie...you are such a sweet friend! I also got my order from My So Called Junky Life. I love this shop....there are so many wonderful things. I could NOT resist this sweet old fabric. It comes on a wooden spool, or a clothespin, or in a larger piece. Of course, I had to have all three. And how cute are these hearts cut from an old quilt? 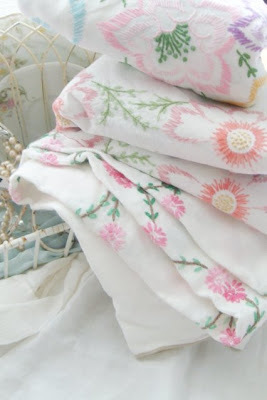 And, you can never have too many vintage millenery flowers. I've been working on pillows for my livingroom this week. Here's what I have finished so far. This one has vintage lace and little satin roses. 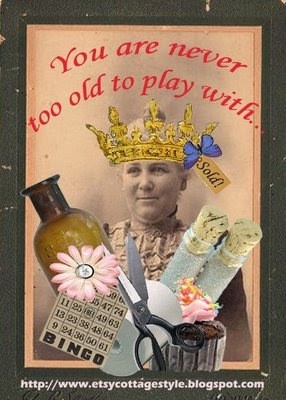 I added a vintage tatted doily to this one. More vintage lace and some pretty ribbon. Despite the mess in my 'still in the process of being reorganized', 'still looking for an old dresser and other storage solutions' studio, I have been trying to work on projects. Here is another one of those projects. Just waiting for something to come in the mail to finish it, and then I'll show you pics. And....last but not least....Molly says 'hi'. Sugar says 'hi' too, but she's being shy right now. Have a great day....do something creative that you love! I won a giveaway on Gabrielle's lovely blog. She sent me one of her beautiful coffee filter pom poms. Look at the pretty stitching on it...the colors are soooo pretty! Thank you so much Gabrielle....I love my sweet gifts. I've posted a few pics of our bedroom before, but since I just made a few minor changes, I thought I'd show it again. I love our headboard....I think old, chippy anything makes the dreamiest headboard. In this case, it's a door that hubby bought me for my birthday a few years ago. Two new favorite additions to our room include my $5 duvet cover (loving it), and the beautiful pillow case (center) that Katie made for me. I love this old print by Bessie Pease Gutmann (sp? )....it's called 'A Little Bit of Heaven'. This was given to me by my mil. Look at the beautiful old frame. ....and mine. I love my wonderful, new, gifted mirror. This beautiful painting is one hubby did as a teenager....can you believe it? It's Lake Louise, in Canada. And I love, love my beautiful cherub lamp (floor to ceiling). This was my mil's. Well, I'm off to pretend that I'm going to accomplish something today! Have a good one!